There are many ways you can support the California Missions Foundation. The Foundation welcomes individual, foundation and corporate donations, as well as honoraria and memorial tributes. Contributors can also provide for the Foundation in their estate planning. Your contributions will support a variety of restoration and preservation projects at all 21 missions, but donations can also be earmarked for particular projects or specific missions. Please call Foundation staff at (805) 963-1633 or email us at info@californiamissionsfoundation.org for information on the options available. Because the California Missions Foundation is a secular California nonprofit public benefit corporation, contributions are tax deductible under Section 501 (c) (3) of the Internal Revenue Code. The California Missions Foundation Federal Tax Identification Number is: 94-3240152. And please remember: Many companies match their employees' charitable donations. Be sure to ask your company's human resources department if your donation can be matched. Thank you for your interest in the California Missions Foundation. The California Missions provide each of us the opportunity to walk through time. Like California's great Redwoods, the missions are living history. They reflect the work and inspiration of our forefathers, and the dedication and care of succeeding generations to keep these great compounds vibrant, relevant and - perhaps most important - accessible. Every year millions of Californians and travelers from across the country and around the world visit the missions. Many of them are California school children who can hear, in the echo of their steps on the aged stone floors, the voices and lessons of the past. If we are to continue making this special experience possible, we need your support. As you navigate through this Website, you will find there is a purpose for and a need to preserve the missions. You can also learn how you can help to financially support the important work of the California Missions Foundation. 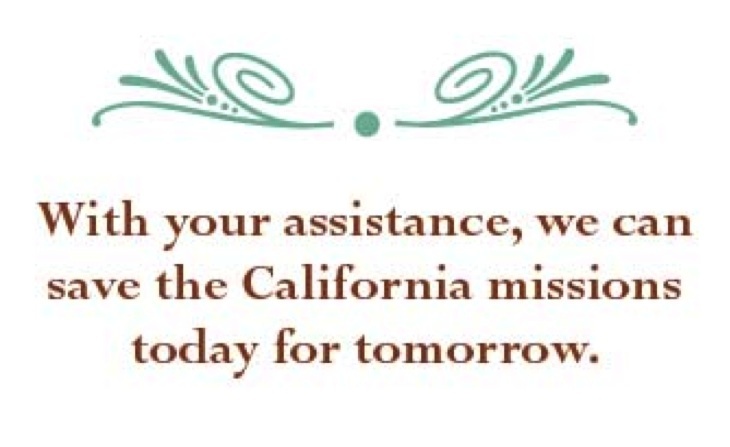 With your assistance, we can save the California missions today for tomorrow. We are asking for your help, and we thank all of you for taking an interest in the California missions and in the Foundation. 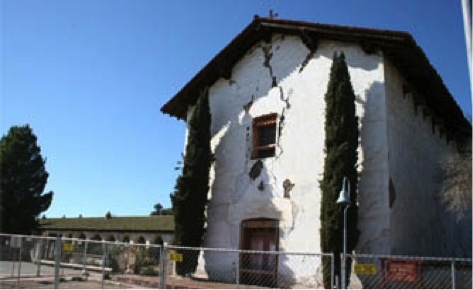 The restoration needs of California's 21 missions are great, and while there is significant work under way, there is still much to be done. All of the missions have needs and they are constantly evolving. Earthquakes, weather and the wear from decades of use all take a toll. With the necessary funding, we can conduct the work necessary to assure the missions will continue to serve still more generations of Californians.